While this can be a one-person project if you are handy, you might find it useful to have a helper hold things steady while you work. 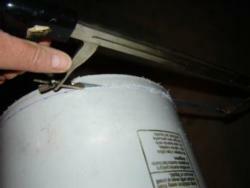 Using the pliers, remove the metal handles from each bucket. It is easier if you use one pair of pliers in each hand to twist the handle out of its socket. Have your helper hold the bucket still while you do this, or hold it steady with your knees. Measure up 1/2" from the bottom of bucket one, and use the marker to mark the spot in several spots around the circumference of the bucket. Lay the tape measure along the marks and follow it with the marker to draw a line all the way around. This will be your sawing guide. The line should be high enough on the bucket so that when you saw through, it just cuts the bottom off and not much more. Do the exactly same thing to bucket two, but mark your line 1 inch to 1 1/2 inch up from the bottom, so that bucket two will be 1/2 to 1 inch shorter than bucket one. Lay bucket one on its side on a raised surface, hold it still with either your helper or your other hand, and use the hacksaw to cut the bottom off the bucket along the marker line you drew. Do the same to bucket two. Use the sandpaper to sand the edges smooth and remove any hanging threads of plastic that remain. 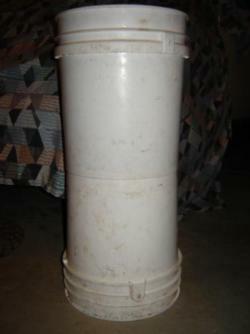 Test your buckets by standing the shorter one bottom up and then inserting the longer one into the first. Because the buckets are designed to nest into each other, and since you cut one shorter and therefore slightly wider, they should go together easily and tightly with just a small twist. If you are having trouble because they seem too tight, you may have to sand or file the shorter one down a little more until you get it wide enough to accommodate the longer bucket. Once you determine that they will twist together snugly, take the buckets apart. Now you are ready to drill the 2” holes in the sides. 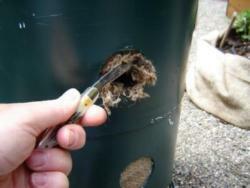 You may want to mark where you will place the holes with your marker before drilling. Make the holes approx. 4” apart, and stagger them so the spacing seems random. Start the top row just under the thick rim of the bucket. Mark 5 or 6 holes in this top row, 4” apart. They don’t have to be in a straight line, a little variation is better. The second row will have only 4 or 5 holes, approx 4” from the top row, but with staggered placement (not directly below the top holes, but off-set between them). You may have room for 2 holes at the bottom, also in off-set placement. Don’t mark too close to the very bottom. Remember you will be tucking the buckets together in the bottom one inch. Have your helper hold bucket one steady on its side, or you can lay it down between your legs and hold it that way. Wear your safety goggles for this step to avoid plastic dust in your eyes. 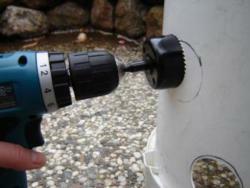 Using your drill with the 2” hole bit attached, drill holes in the side of the bucket at your marks. Do the same with bucket two. 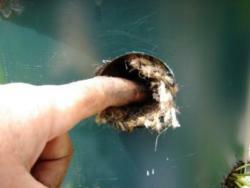 After drilling use sandpaper again to smooth down the edges of the holes and remove any hanging plastic threads. If you are planning to spray paint your tower, now is the time to do it. Keeping the buckets separated; spray paint the outside surface with any desired color. 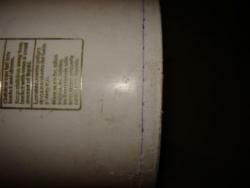 Be sure to select a spray paint that is made for plastic or PVC so it will adhere to the bucket. When the paint is completely dry (see directions on the paint can) you can fit your two buckets together into the final tower. Slide one bucket bottom into the other and twist them together until they are snug. Be sure they are as straight as you can get them so your tower doesn’t lean to one side. Place your bucket in a sunny spot near a convenient water source. 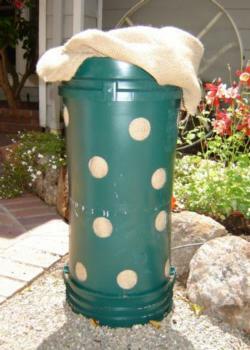 Line the tower with burlap, weed block cloth, or garden cover material. This will keep the soil from falling out of the holes. Cut a piece of the material the same height as your tower and approx. 36” wide. The width should be a little wider than the inside circumference of the tower. Place the material inside the tower against the inside wall. Hold it in place with clothespins while you work. A helper comes in handy at this step. Overlap the edge of the lining where the ends meet. 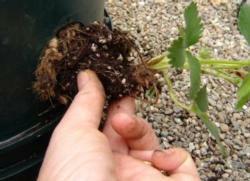 If you are planning to hand-water your strawberries, you can begin to fill the tower with soil at this point. If you are going to use a drip line, see the next step. If you are planning to use a drip irrigation line to keep your strawberries watered, run a length of 1/4” spaghetti tubing to the tower and attach one or two 1/4” soaker hoses to the line (use a tee connector if you want two soaker lines). You can run the soaker hoses(s) up from the bottom through one of the holes. If you run the hoses(s) down from the top of the tower, secure the end of the hoses(s) at ground level so they stay in place. The hoses should run vertically through the center of the tower to ensure all the plants get water. Use a helper to hold the hoses in place while you fill the tower with soil. 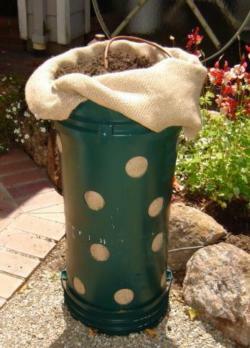 Potting soil with amendment added is the best medium for your tower. 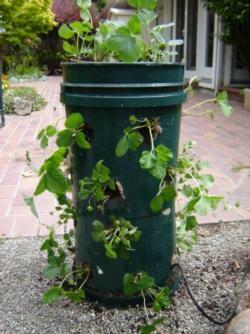 Potting soil has excellent drainage, which is critical in a vertical planting like this. But potting soil has minimal nutrients, and they will be used up right away by your plants. So combine the potting soil with about 1/3 finished compost, or mix time-release fertilizer granules into the potting soil in the ratio recommended on the package. These granules will release a balanced fertilizer over a 3 month period. Finished compost will do the same. Strawberries require nutrients to grow and give a good yield of fruit. Do not skip this step! Slowly add your soil mix into the tower, gently patting it down as you go, to minimize the settling that will occur after you water the first time. 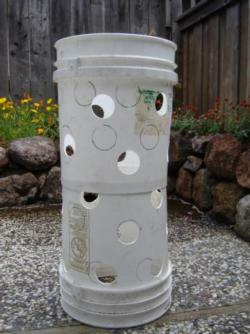 As you fill the tower, the soil will hold the lining in place and you can remove any clips or pins that were used. 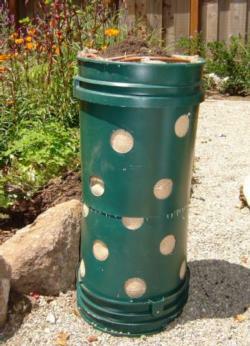 Fill the tower right up to the top because it will settle some after a short time, and you will want to plant 3 or 4 plants at the top of the soil. 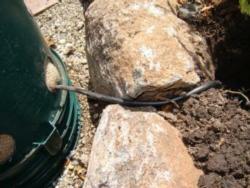 If you are using a drip line, keep it vertical and centrally situated as you go. Your tower is now full of soil and ready to be planted. Using a sharp pair of scissors or a pocket knife, make a slit in the lining at each of the holes. Reach through with your fingers and make a small hole in the soil, deep enough to hold the root portion of your plant, and place one strawberry plant or runner through the slit and into the soil. Firm the soil into place around the plant. Do this for each hole, and then at the top of the tower plant 3 or 4 of the remaining strawberry plants to finish it off. You can wait a couple of days before planting these top few. Wait for the soil to settle, then add more soil up to the rim of the tower before planting the top. Once you have planted all the holes, give your tower a good watering. 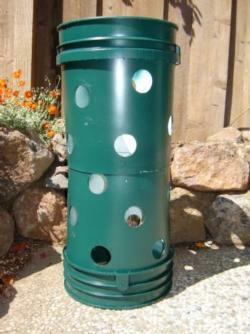 If using drip irrigation, run the system until the tower is moist throughout but not soaking wet. If by hand, water gently from the top of the tower, and use a narrow-spouted watering can to water directly into each of the holes where each plant is located. A printable version of these instructions (downloads as PDF) is here. For more information about growing strawberries, see the UC Garden Web.